Are you looking for a free Customer Satisfaction Survey template? Then stop looking! You'll be up and running in seconds with SurveyTalent, and you'll never have to worry about programming, databases, webservers, data validation or HTML code. Understand why your users use your product and/or services, and what you should do to improve it, with this free Customer Satisfaction Survey template. You don't have to hire an expensive research agency to do your research, when you can simply do it yourself with SurveyTalent! SurveyTalent helps small and large businesses all over the world to build, distribute and analyze beautiful online forms & surveys. You too can use SurveyTalent to launch a Customer Satisfaction Survey today. Simply install the template and we take care of the rest. You won't have to worry about databases, spreadsheets, data security, validation or HTML code - that's what we are good at. With more than a 100 features SurveyTalent has your online form & survey needs covered. 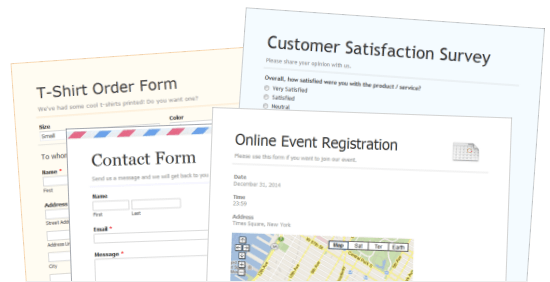 Customize the look and feel of your Customer Satisfaction Survey. Use logic to hide irrelevant questions and pages from a respondent. Create beautiful personalized reports with your selection of responses and charts. And whenever you need support, we'll be there to help you out. Save Time. Launch a Customer Satisfaction Survey in seconds. No programming or HTML knowledge required.